Please pay by cash or cheque. Cheques should be made out to "B. Hunter Driver Education Ltd". You will be issued a receipt. A deposit is required at the start of the first classroom session when the formal registration is completed. The balance is due during the in-car lessons. Current Students may elect to use their instructor's car for the G2 road test for an additional fee of $135* including HST. 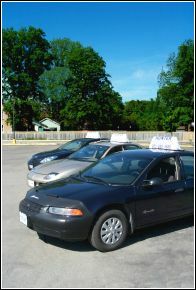 Instructor's cars are available for the G road test for an additional fee of $150* including HST. Review lessons are available on an "as need basis" prior to the day of the road test at the rate of $40 per hour lesson . Students who do not yet have their G1 Licence may still attend the classroom sessions, but must obtain their G1 ASAP. The G1 licence is required before commencing any in-car sessions. Students must bring their valid G1 Licence to every in-car lesson and show it to the instructor. Please contact us to sign-up for courses. *Fees for programs and / or road tests include HST and are subject to change.